Have you heard the latest regarding the PV2 standards? Cimetrix was among those recognized for their work on the PV2 Standard last week. 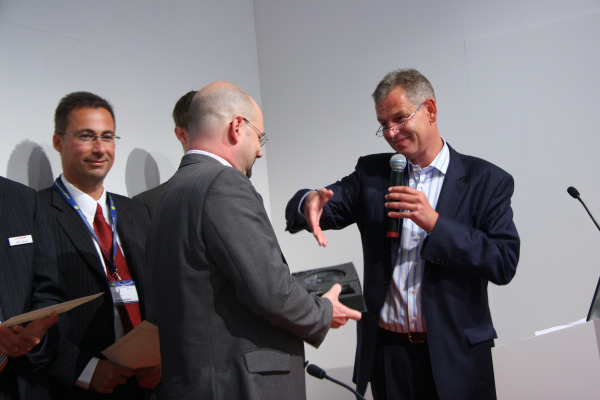 On Tuesday, the PV-EIS task force was awarded the SEMI Europe Standards Merit Award 2009. This was the first time that a team has received the award since it was established in 2001. Our own Bruce Febvret was there to receive the honor on behalf of Cimetrix. He and Brian Rubow have served on the task force since its inception in September 2007. Brian Rubow, principal engineer,will discuss common quality issues and performance challenges for PV 2 Standard implementation. The paper that we presented at the European PV SEC event last week will also be made available to all webinar registrants.